The Reunification Express was not exactly the “Orient Express”! 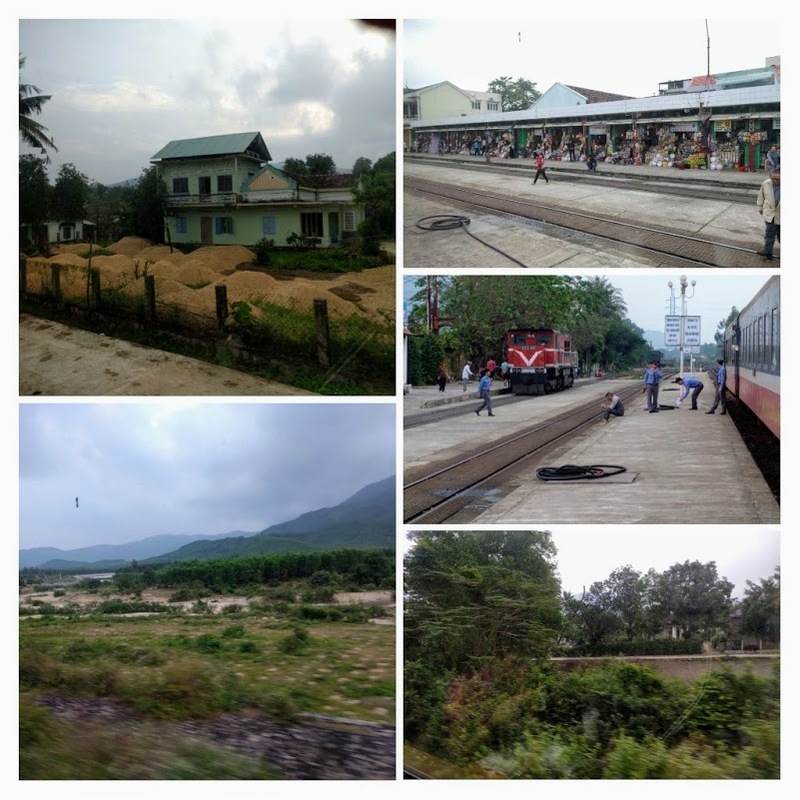 Despite mixed reviews from our online research and a Vietnamese travel agency’s strong advice to “fly instead”, we were not deterred from experiencing the 17 hour train ride from Ho Chi Minh City north to Da Nang, the nearest stop to the ancient city of Hoi An where we planned to spend two weeks. Here are the Highlights (and lows!) of our Journey. Green on Map. Boarding the train went smoothly and we found our cabin without any trouble. We had booked lower bunks in a Soft Sleeper cabin which accommodates four people. The top bunks were occupied by a young Vietnamese man and a Vietnamese woman. Unfortunately, neither one was particularly interested in communicating with us although we spoke briefly the next morning with the woman who understood a little English. Our “soft sleeper” bed was covered with a very thin mattress and a sheet, a pillow and a blanket. After five months in Southeast Asia we were used to a “firm” mattress so we expected it to be hard — and it was! 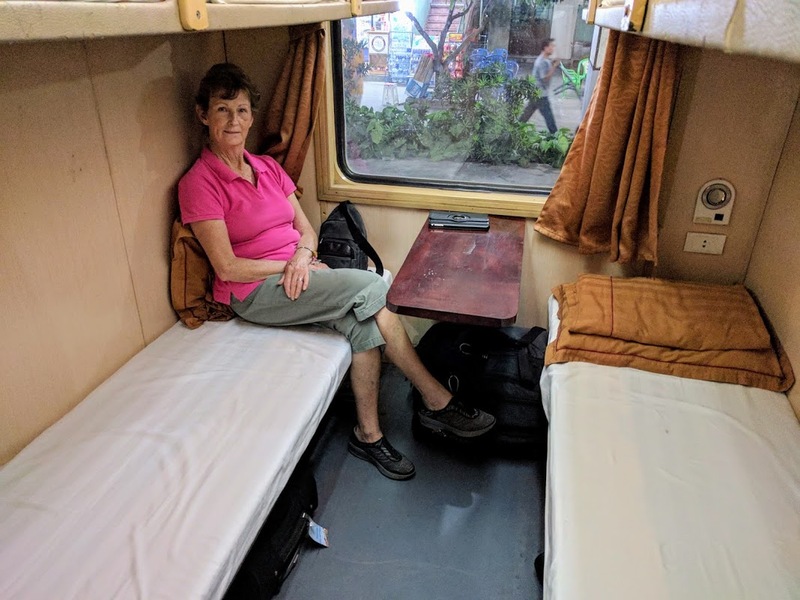 However, it was definitely a step above the “hard sleeper” accommodation which consisted of six bunks per cabin with wooden planks and no mattress! We were thankful. The train left Ho Chi Minh station exactly on time at 7:30pm and we wound slowly through the city, watching people cooking and eating dinner in front of their homes and stores along the track. Once out in the countryside we settled down for the night. The train tracks are narrow gauge so the train rocks and rolls quite a bit! Bill didn’t have a problem sleeping but Priscilla spent the night alternately reading from the iPad and falling into a fitful sleep. Sometime during the night Priscilla became aware of some movement on our backpack on the floor between our bunks and she was sure it was a little mouse looking to share the snacks we had packed for the journey! She zipped the backpack and, keeping one eye open for a while, saw movement again, then nothing. Guess he went away to find food somewhere else! Watching the sun rise over the rice fields was worth any discomfort and by 6:30am Bill was back in the land of the living and joined Priscilla in marveling at the scenery passing by. Train staff came by with strong Vietnamese coffee (delicious!) and we munched on our snacks. Vietnamese breakfast (noodle soup – probably lukewarm!) was also offered but we declined. 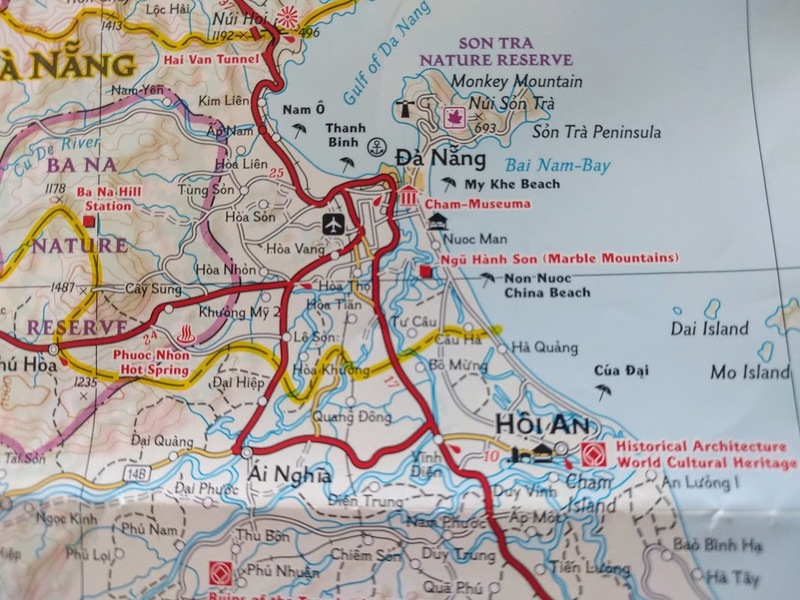 After a few hours, at 12:30pm, we arrived at Da Nang station and were met by our private car and driver, arranged by the hotel, for the 40 minute trip to the Sun Boat Hotel in Hoi An. Would we recommend this rail journey to others? Yes … but with the understanding that there are a few caveats. The toilets, although Western type, were not particularly clean to begin with and became more odorous as the journey progressed. Priscilla made sure she used them as little as possible! Even the “soft sleeper” isn’t soft and although our sheet, blanket and pillowcase looked clean when we boarded, the staff did not change the bed linen when one of our cabin mates disembarked. Anyone joining the train on its journey north will probably have bed linen already used by other passengers! 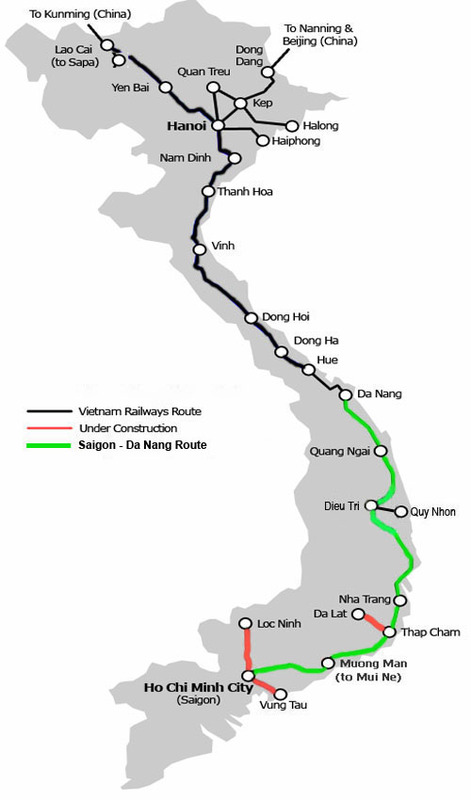 We’re glad we added this train journey to our exploration of Vietnam but would not recommend traveling all the way from Ho Chi Minh City to Hanoi. 17 hours is quite enough of an experience! We chose to spend two weeks in the charming historic town of Hoi An because we knew we needed some time to relax and regroup before heading north to Hue and Hanoi. By now we’d been traveling for five months and our stamina was beginning to fade a little! Our hotel was located on the river within walking distance of town but out of the hustle and bustle which suited us just fine. Situated on the banks of the Thu Bon River, the ancient town of Hoi An was an important international trading center in southern Vietnam from the 16th to the 19th centuries, attracting foreign merchant ships and traders to annual commercial fairs. As a result, Dutch, Indian, Chinese and Japanese traders built shops and established their own permanent quarters in the town. 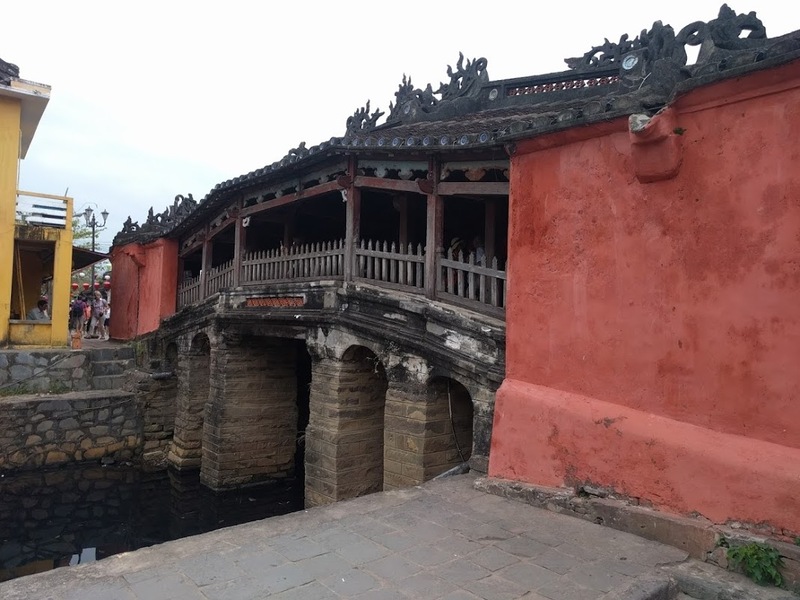 By the end of the 18th Century Hoi An had lost its importance as a trading port due to the silting up of the mouth of the river as well as the fact that the French had developed nearby Da Nang as the new trading port. Fortunately, many of the beautiful old shophouses, pagodas and assembly halls in Hoi An were preserved intact and in December 1999 the town was declared a World Heritage Site by UNESCO. 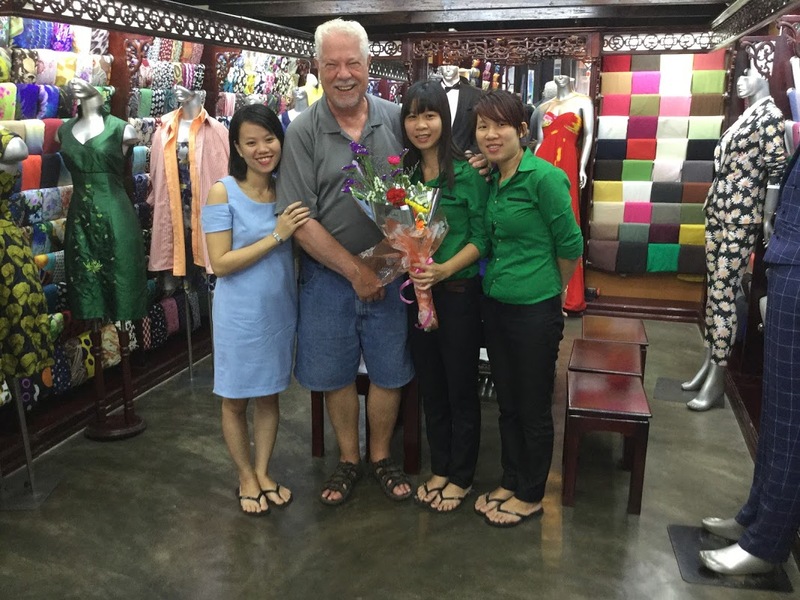 Hoi An has rapidly become a Tourist town and is known as the place to have clothes made. We did! It seems every second shop is either a tailor or a massage spa and everywhere vendors are attracting your attention to buy! buy! buy! Street vendors even come into restaurants when you’re eating, trying to sell you pop-up cards, paintings, silk scarves, pastries, nuts – you name it! It’s a little aggravating but you learn to ignore it. We toured the town! We walked the streets, admiring the numerous beautiful old buildings, many with colorful plants cascading from above. We purchased a ticket for 120,000 VND each ($5) that allowed us to enter five designated homes, museums, temples and the famous Japanese Covered Bridge. 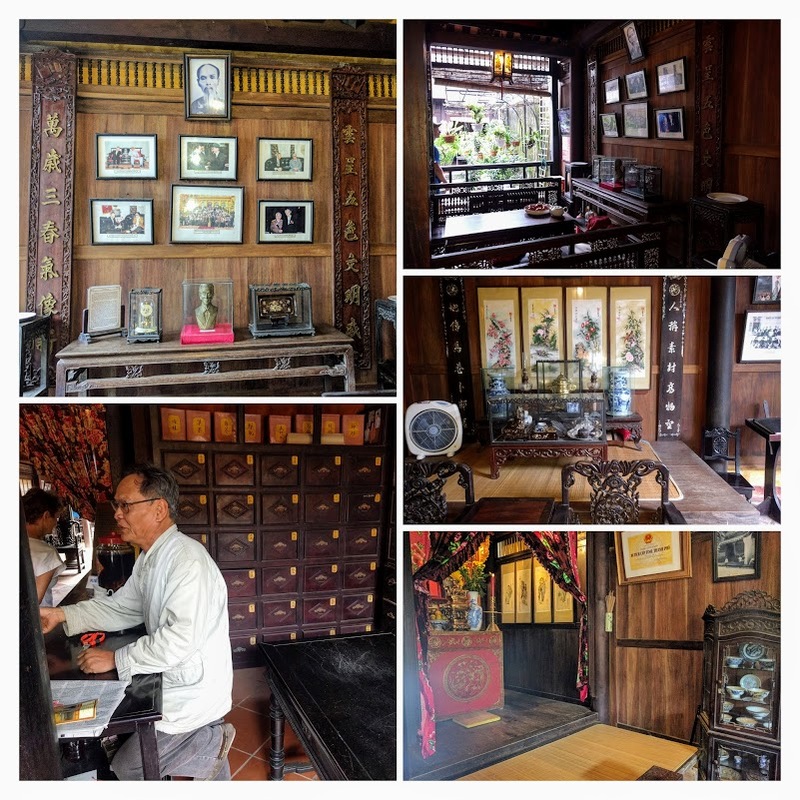 We visited the House of Duc An and the old man living there who stamped our tickets told us he was a 6th generation family member. We learned that the floor plan is typical of an original Hoian style shophouse. It had a shop in the front, then a large courtyard in the center and a work space in the back. The pillars in the courtyard were beautifully inlaid with mother of pearl. The living quarters were upstairs. 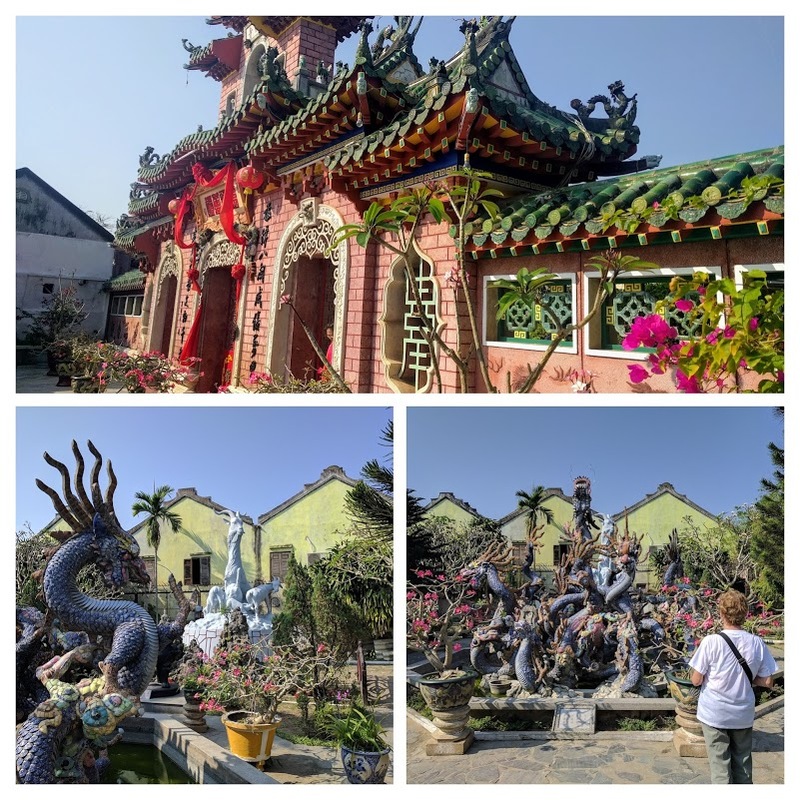 We also visited two Chinese Assembly Halls, the Fujian (with the temple dedicated to the Goddess of the Sea) and the Cantonese, which features amazing dragon statues, among others. These halls are used today for special events and meetings. 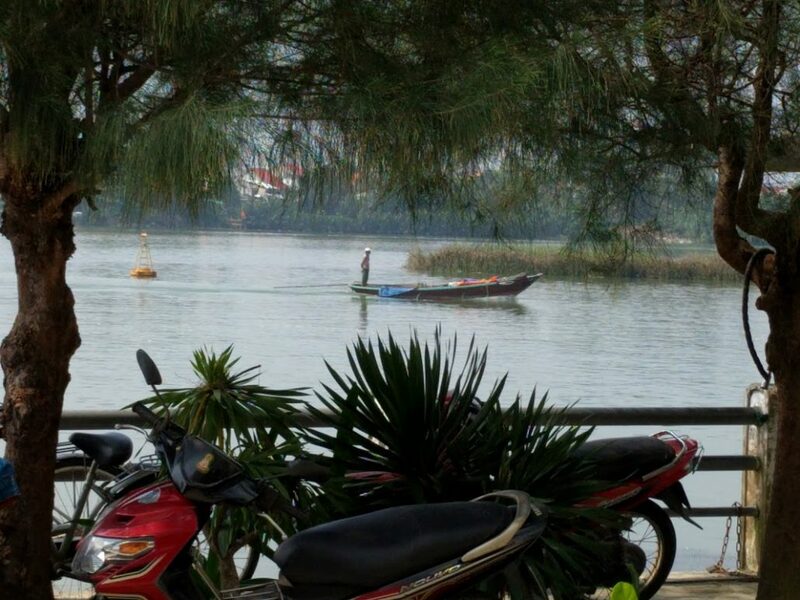 With each visit we better understood life as it had been in Hoi An’s heyday. And we ate! Hoi An boasts a wide range of restaurants offering every imaginable type of food! 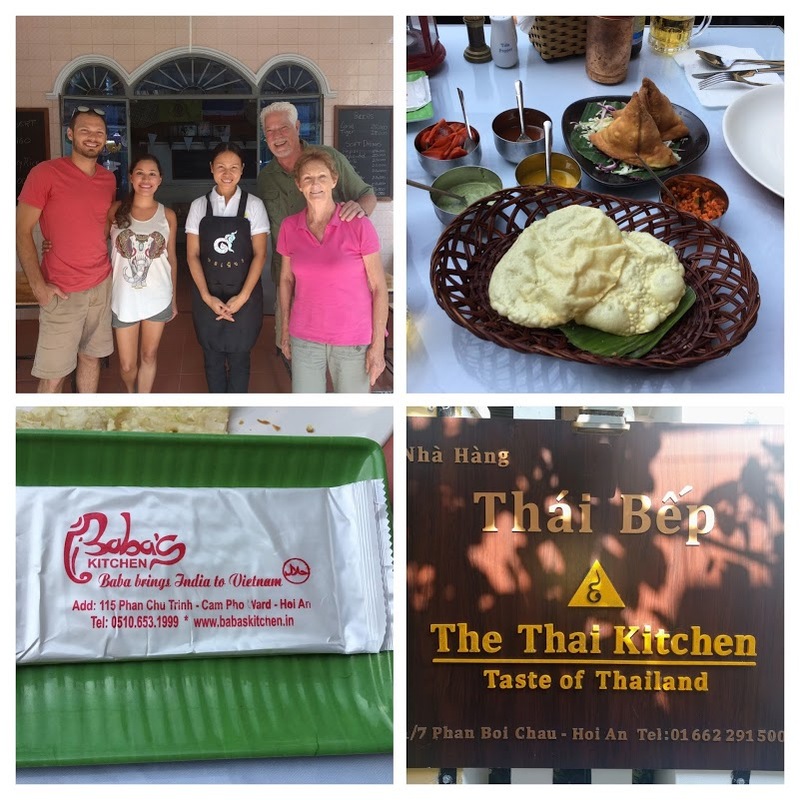 Interspersed with Vietnamese meals, we enjoyed an excellent curry at Baba’s Kitchen, a tasty Italian lunch at Good Morning Vietnam and authentic Thai Food at Thai Kitchen. Also, great burgers, banger and mash, Hoi An’s signature dish – Cao Lau – which we ate at Café des Amis, and much, much more! Eating at restaurants in the old town is pricey but we felt it was worth it for a change. To learn about the legend behind Cao Lau CLICK HERE. Want some action? Rent a bicycle – most hotels and guest houses provide bicycles either free or for a small daily rental fee. Pack a picnic lunch and cycle through the stunning rice fields or along rivers and beaches that surround the town. Rent a scooter if you can handle the traffic, which can be quite chaotic. Take a day tour to Cham Ruins at My Son or Marble Mountain or the DMZ. We relaxed! Two weeks flew by and we were soon saying goodbye to our Sun Boat hotel’s staff who had looked after us so well during our stay. We had enjoyed amazing breakfasts, relaxed at the pool, worked at our computers under the umbrellas on the patio and sipped a cocktail while watching the boats on the river as the sun set. It was perfect! We added Hoi An to our list of places to revisit and headed north.